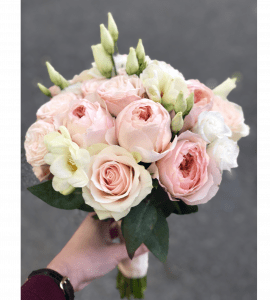 To find a beautiful bouquet for the wedding is not difficult, but to choose the perfect version, which would be harmoniously combined with the image of the bride – is a whole test. To make this difficult choice, you need to focus on two main points: what flowers are popular at the moment and which composition will suit your wedding style. 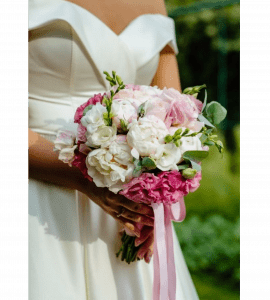 How to choose a bouquet in accordance with the style of the bride? It often happens that girls order from florists the same bouquet as they liked on the photos on the Internet. And already at the wedding they notice that it looks absolutely not as colorful as they would like. 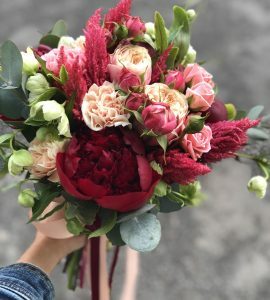 And it’s not that the expert did a bad job, but many people do not think about the need to select flowers for the overall context of the wedding. And for this it is worthwhile to figure out which compositions are best suited for different styles. Rustic is a popular wedding style to date. It is honest and straightforward, so the flowers and the shape of the bouquet should be simple. It is very important that the composition looks slightly careless and natural, as if you just gathered these flowers in a clearing. Therefore, for such a bouquet is better suited daisies, miniature carnations, campanulas, lilies of the valley, cornflowers, buttercups, sunflowers, poppies. Do not use accessories. Boho is a style that is different by audacity, boldness and joy. He does not tolerate anything that could interfere with comfort, so the bouquet should be appropriate. Wedding compositions in the style of bokho necessarily consist of anthuriums, orchids and succulents. Vintage style includes ancient things. He has a special charm and tenderness. A bouquet for such a wedding should be modest, uncomplicated and fully fit under the bride’s dress. Violets, hydrangeas, jasmine, peonies and pansies will fit perfectly. Classics never go out of fashion. Generally such compositions consist of roses, lilies, cinnamon, calla, lilac. It is very important that the shape of the bouquet resembles a sphere or a hemisphere. 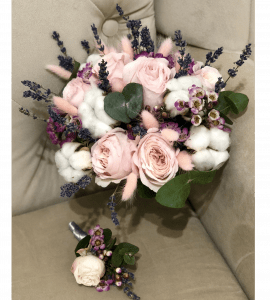 portbuketnitsa – a special device that inside consists of piaflora (a material resembling a sponge), where flowers are inserted (the shape of such a bouquet can be completely different). It is also important to choose the right color for the composition, which should be beautifully combined with the bride’s dress. 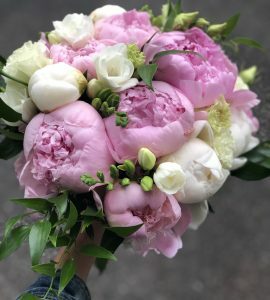 Where is it possible to buy a wedding bouquet in Kiev? fast delivery across Kiev to your home or office. A wedding is a moment of happiness that should not be overshadowed by anything. With our flowers this day will be the best in your life!